Two weeks ago, in a blog on Finextra, we stated that our company had obtained initial funding and support for a project to design a new suite of UK payment services, to set against those being implemented by the UK’s New Payment System Operator (“NPSO”). This project now has a name – Project Carlton – and it is at the stage where we have delivered our initial research paper to the sponsor for their review. It is likely that this research paper will be put into the public domain once it has been approved. The research paper is a trenchant dismemberment of what has happened under the heading of UK payments landscape over the last four years, starting with Faster Payments’ New Access Model and the Payment Systems Regulator’s toothless Market Reviews into Indirect Access to Payment Systems and into the Infrastructure provision behind BACS, FPS and LINK. 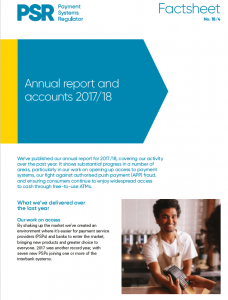 The PSR has just issued its 2017/18 annual report in which it vaingloriously claims manifold achievements, although they all fail one or more of the three acid tests of an achievement: firstly that the event happened at all, secondly whether the claimant had anything to do with its occurring, and thirdly whether the outcome was incontestably positive. On that basis the PSR scores a nil return. We then move through Payment Strategy Forum (“PSF”), its usurpation by the proponents of New Payments Architecture (“NPA”), its invalid splitting off of the Financial Crime streams from the NPA streams, and its valueless proposals for new services that supposedly “meet end-user needs”. It is just too much of a coincidence that these are the self-same new services that Payments UK proposed out of its World Class Payments project in 2015, and that no end-user ever seems to have specifically requested. We even find out from the NPSO’s Board minutes of its meeting on 2nd May 2018 that one of the proposed new services – called “Confirmation of Payee” – has not passed its feasibility stage, this being after four years’ worth of work on it. Apparently a working group has had to be set up to “try to reach a consensus on legal issues including disclosure of personal data, fraud, PSD2, privacy and consumer protection”. The usage of the word “including” infers there are further issues even beyond this already long laundry list. Then we drill down into the “Simplifying Access to Markets” stream of the PSF and pose the simple question: has access to markets been simplified so far, and will NPA achieve that? The PSR’s answer to the first question is yes because there have been 10 new direct participants in UK payment systems. Our answer is no: 10 direct participants is out of a figure of about 1,590 payment service providers in the UK, many of whom cannot even get a bank account, let alone manage the £500,000 which is the minimum upfront entry ticket to payment system membership. The figure of 1,590 is composed of 440 Credit Institutions, 400 eMoney Institutions and Authorised Payment Institutions and 750 Small Payment Institutions. The PSR’s “achievement” has benefited at most 0.6% of the UK’s payment service providers, and at least 1 of the 10 direct participants built its own technology and invested the same amount as they would have had to 5 years ago, before the PSR’s establishment. Now we have the inevitable results of all of this, and of the lip service paid to resilience: outages of both the Visa and Faster Payments systems. We have a comical governance model in place at NPSO, without relevant experience of payments and without the level of achievements in any field that would provide comfort either that NPA can be delivered successfully or even that current, nationally critical services can be maintained without service outages. We compare the UK’s plans for a layered model using ISO20022 XML with the Single Euro Payments Area model, in which innovation has been strangled and value-adding functionality eliminated, and we explore in whose interests it is that ISO20022 XML be adopted in the UK. We delve into the history of Faster Payments, how it is a mongrel system – a Push payments service built on top of a Pull payments chassis – and how it has become the seedbed for Authorised Push Payments Fraud. We conclude how inappropriate it is that Faster Payments should become the universal clearing and settlement layer under NPA. The detriments currently afflicting UK payment service users overlap hardly at all with the supposed benefits brought by NPA and not at all with NPSO’s proposals for new services. Besides Authorised Push Payments Fraud we have withdrawal of free-to-use ATMs, withdrawal of cash collection services, high deductions from proceeds of card payments for merchants, and contactless payment fraud – including that contactless payments can still be made after a card is cancelled. Combatting financial crime should sit right at the heart of developments in UK payments. Instead the Financial Crime streams of PSF have been farmed out to the banking trade body UK Finance, rather than being embedded in NPA. This is a terrible mistake, which goes hand-in-hand with the promotion of Push payment services at the expense of Pull payment services, thus ensuring that payments are irrevocable. Revocability – for example under the Direct Debit guarantee and under the consumer protection for card payments – is a key consumer protection, is germane to Pull payments, and requires a bank to put in place a credit line for the beneficiary – requiring the bank to do proper Due Diligence KYC and not the more superficial level of KYC they carry out when only non-credit services are used. Pull payments are the future, not Push payments, and this is why Project Carlton proceeds in the diametrically opposite direction to NPSO and NPA, and seeks to make positive progress against real problems where the PSR prefers vacuous self-congratulation.